sewing in the past: photo of the day. this photo is just absolutely gorgeous. i am in love with that black and white dress. It is a gorgeous photo. My favorite part is the BIG bow. That is such a lovely poto! :) So darling! I wish I had that in my wardrobe! oooh! What a stylish outfit! *sigh* I want that dress! Love to dress! Sort of sailor collar, big bow, elbow sleeves, full skirt. LOVE. Oh, and the hair. LOVE the hair! Wow! What a great photo! Where did you find it? 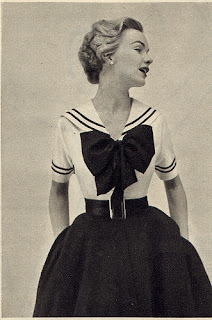 I would love to make a blouse like that someday. In linen. Someday! why to get balloons at c.c. 's pizza. cream colored ponies and crisp apple strudel. happy day after labor day!